Some have been playing all winter, but if you prefer your outdoor ping pong accompanied by warm weather and sun, you’ll be able to play at Bryant Park all summer long. 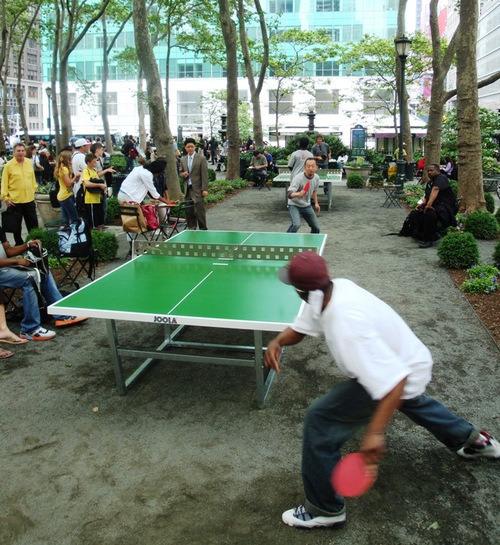 Staffed hours will resume at the Bryant Park Ping Pong Area on April 12. Our attendant will monitor a sign up sheet for games at our two state of the art outdoor tables, and provide paddles and balls free of charge to anyone who wishes to play. If you show up solo, there’s no need to worry. The attendant can set you up with a partner for a little friendly competition. Start practicing soon because we have a number of public tournaments and fun events in the works for this season. As always, you are welcome to play at the tables during un-staffed hours with your own ping pong paddles and balls.